Looking back to move forward - that’s what the Nikon Df is all about. This retro style DSLR marries the classic Nikon SLR style of years gone by with much of the Japanese company’s modern tech. It’s the only Nikon DSLR capable of supporting current F-mount and older non-AI lenses thanks to a collapsible coupling lever in the design. So if you’ve got old lenses it could be the perfect partner. We suspect there’s a dash of influence from the rising popularity in the Fujifilm X-series compact system cameras that’s helped aid in the Df’s conception. But irrelevant of that, this is a camera that long-time photographers have been asking for: a full-frame DSLR with proper manual control dials finished in a style that raises that sense of nostalgia. A camera that puts you in the driving seat, no gimmicks, and gives the best of Nikon’s imaging abilities. But is nostalgia overrated? And in its attempt to avoid any gimmicks has the Df gone full circle, positioned itself at a "because it can" price point and missed out on a truly future-proof specification that savvy photographers will seek? We’ve been living with the Nikon Df to find out whether it’s induced a state of nostalgic wonder of left us wondering why we’re not just using our Nikon D610 instead. 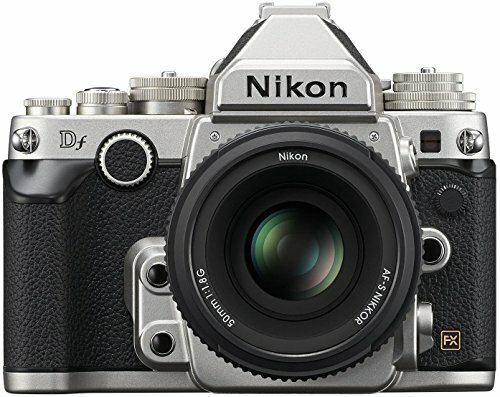 The Nikon Df is the modern equivalent of the Nikon FM2. Sort of. It’s not the 70s or 80s any more and obviously this camera is an entirely new and digital format rather than film model. Designed to appeal to reminiscers and modern day snappers who have their retro hats on, the silver finish model we’ve got in for review certainly has a decades-old aesthetic about it. It's also the only recent Nikon camera to opt for the classic non-italic logo. And we like the way the Df looks. In pictures it looks great, but then in the hand it’s a slightly different story. There are a couple of things that perplex us: first, the sheer size of it - there’s little sensation of it being smaller than a D610, even though, technically, it is - and, second, the finish just lacks a premium feel. It’s not that corners have been cut in the camera’s making. All the mode dials, for example, are made from metal and do feel great. It’s just the faux leather coating that dresses the majority of the body looks more Fujifilm XF1 compact camera than full-frame premium in this regard. Although for many we suspect it will be a matter of taste. By its very design the Nikon Df has a specific - and niche - potential audience. You know that, we know that and undoubtedly Nikon knows that too. The camera’s price attests it, as do those variety of mode dials on the camera’s body. This isn’t one for point-and-shoot snappers. It’s not an obvious choice for first time full-framers either. It will catch the eye of specific prospective buyers. But does turning the clock back and using an array of physical mode dials add genuine benefit in use? We’re all for full manual control, but each and every one of those dials locks into place and needs to be released with a press-and-hold button or, in the case of the shooting mode dial, raised and rotated. We think it’d be potentially useful to have a mechanism to "open up" each dial, in a similar format to the Pentax K-3. Shutter speed adjustment is the exception to the rule, as the dial does not lock between its 1/4000th sec and 4 second specifications. For 1/3 Step (auto), X (sync) and T (time) it locks into place, but bizarrely B (bulb) can be clicked out of place just as freely as any other shutter speed can. We really like the black lettering which turns to red to identify speeds greater than a full second or more - helps to keep things extra clear - and the blue finish of the 1/3 Step option. Aperture values are controlled using the front thumb dial, dependent on the shooting mode and assuming a modern lens is attached. Although that’s typical of any DSLR, in the Df the dial is poorly positioned. It faces vertically upwards, its path is part blocked by the strap eye and we found ourselves slip a thumb from the dial from time to time. It lacks the more considered functionality of a modern DSLR, and that’s at the expense of styling. Form over function. There’s a sense of the Df leaving one foot in the past given its specification. The main nuts and bolts see it function much like the Nikon D600 or more recent Nikon D610. Even though that means tech a couple of years old and little to nothing brand new that’s actually no bad thing overall. This is tried and tested tech. The camera’s 39-point autofocus system isn’t the top-spec 51-point system as found in the Nikon D4, but it’s still swift and capable throughout its various setups. We would have liked extended low-light sensitivity, however, as the -1EV autofocus ability trails behind some of the more recent Nikon offerings by a stop. A small thing, but that’s the general story with the Df’s specification. There’s an AF/MF switch to the front side of the camera to toggle between autofocus and manual focus options, complete with a hold-and-press button to make additional autofocus adjustments. The choices are single (S) available in single point or auto, or continuous (C) which can use a single point, or an array of 9, 15 or 39 points, the fullest array with an optional 3D tracking mode. It all works really well for still or moving subjects, meaning nothing feels off limits when shooting using the Df. Making AF adjustments is a bit scruffier than with other high-end Nikon DSLR cameras, however, given there's only a small top display and so the use of the rear 3.2-inch LCD screen is instead required. As we’ve already mentioned that upright front thumbwheel can feel a little awkward to use for making these AF adjustments, and a couple of times we tilted the camera forward to see the LCD screen and rested fingers against either the Pv or lower Fn function buttons by accident. As much as we like having these function buttons that was a nuisance in a couple of situations, as much as we quickly adjusted for it. Elsewhere the inclusion of D800-standard weather-sealing and a new shutter capable of 5.5 frames per second maximum and rated at 150,000 cycles gives the Df an edge over the earlier Nikon D600. The 100 per cent field-of-view optical viewfinder also sits proudly to the rear, complete with a circular eyecup that not only looks cool but is comfortable in use. Battery-wise we took several hundred shots before the Df showed any sign of depleting its visual battery meter. This is displayed on that small top panel, and as it only shows up remaining power in divisible thirds, it’s less reliable as a measure than the Nikon D600’s one which is divided into fifths. However the Df should last out longer - just not quite as long as the giant battery of the Nikon D4 - and will easily see you pass 1,000 shots per charge. The official quota is 1,400 per charge. And we can’t contest that. Sticking to its stills only policy - the Df is the only Nikon DSLR since mid-2010 that can’t capture video - the Df relies on the same full-frame sensor as found in the top-spec Nikon D4. That’s great if you’re after immense 16-megapixels image quality. But, in resolution terms, it’s miles behind the entirety of the remaining Nikon DSLR camera line. Relying on 2012’s Expeed 3 processing engine rather than the latest Expeed 4 also goes to show a lack of progression. Our take on it isn’t about the numbers though. It’s too easy to get hung up on that just because something seems like it's a step behind. Yes we would have liked Nikon to push forward and make` the Df even more appealing with newer tech, but that just isn't the case here. And we've come to accept that. And we've accepted it for a simple reason: the Df's resulting images are undeniably brilliant. Sharp, well exposed, full of detail even at high ISO settings, it’s really a wonderful thing to behold. If you aspire for Nikon D4 quality then here’s the way to get it for half the price (albeit minus most of the D4’s other features, that’s a given). It’s image quality that really makes the Df what it is and pulls it back into the game for us. It’s an imaging machine that delivers throughout a significant portion of its sensitivity range, which is controlled via the manual ISO dial to the top left side of the camera. From "low 1" (L1) to ISO 100 and right up to native ISO 12,800, there are even H1-H4 extension options available on the dial. And for added control there are third stop increments if you’re a stickler for ISO 160 portraits to mimic that pro film sensation. From that wide range of available sensitivity we found the shots up to ISO 3200 still look amazing and we’d have no qualms about using them at scale. The raw files come packed with detail delivered with a grain that has a filmic manner. ISO 6400 is still usable, although the JPEG processing is a little on the harsh side and this continues to diminish sharpness and colour as the ISO increases. We’re not convinced by the need for any of the "high" settings really and think Nikon should have been bolder and left them out - if there’s no video then we needn’t shoot at ISO 204,800 which certainly did not exist decades ago. For the very best results ISO 100 through to the sub-four-figure sensitivities are hard to tell apart. Images are crisp and sharp, while the inclusion of the ISO 50 (equivalent) setting is good news for those looking to get the most out of wider apertures in bright conditions - even if it does mean come at the cost of less dynamic range in its raw files. The quality of what you can get from the Df will, in part, rely on the lens attached to its front. We’ve not been able to test any non-AI lenses for this review so can’t comment on the specific characteristics of older glass. Instead we’ve left the bundled limited edition 50mm f/1.8 G lens on the front of the camera at all times. The prime lens has tied us to a retro way of working while delivering delightful shots and that super-wide aperture certainly has its uses too, even if f/1.8 on a full-frame sensor is a tricky beast to control with absolute precision. It might not rely on the very latest tech, but even 2012’s best offering stands tall enough in 2014 and it’s the resulting images that make the Nikon Df a potentially outstanding camera. The Nikon Df could be called over-ambitious. With the likes of Fujifilm pulling off the retro style with stronger footing in functionality and Sony putting out the affordable Alpha A7 there are considerable alternative retro and full-frame options on the market. As we bounce between the posts in terms of where the review score marker lands for the Df we can’t ignore that feeling that Nikon needs to learn some lessons from this release. People like retro cameras, as do we here at the Lint, but just because it’s a nod to the past doesn’t mean it should compromise on anything at all. Why the Df wasn’t the next step top-spec model rather than a slightly modded D610 is beyond us, particularly at this undeniably huge price point. Not that it’s our job to tell you how to spend your money. It’s more that the Df’s premium price isn’t quite reflected in its exterior finish, nor the overall specification, while the camera is just too big compared to the image we had in our mind’s eye. But as much as we thought we’d made up our mind about the Df and were close to a lower score, we just kept on taking photos, looking at the pictures and being impressed. And that’s what pulls it back from the brink of obscurity because everything that comes out of this camera looks so great. The sensor may not be brand new, but it would be foolish to even attempt to scoff at the top-spec silicon found in the Nikon D4 - the camera from which the Df adopts its sensor and, therefore, image-taking prowess. At times we love the Nikon Df and what it can do. But would we buy one? No. It’s an expensive exercise in nostalgia and one that, at times, makes us realise why the world has moved forward. There’s definitely something in the concept, and while we are taken by the Df’s charms this attempt just doesn’t form into the perfect five star photographic tool that it could have been.